Workopolis published an article recently regarding the twelve skills that Canadian employers are having the most difficulty finding. Can you guess which skill was at the top of the list? Bilingualism. Since Canada is officially a bilingual country, it’s no surprise that bilingualism (specifically the ability to speak fluently in English and French), continues to be in high demand, especially for companies that are working on a national scale. 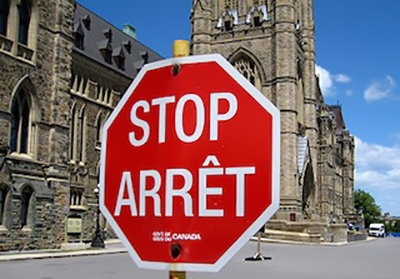 Furthermore, according to Statistics Canada, this demand is unlikely to go away as bilingualism has declined between 2001 to 2011 from 17.7% to 17.5%, despite the increase in bilingual people overall over the last 50 years. This is due in large part to the lack of French exposure among Anglophone students outside of Quebec. Some might argue that this is due to the lack of French programs in our schools. CBC highlighted the fact that 1,000 students are turned away from French Immersion programs every year in 23 B.C. communities, forcing some parents to camp out for several days to secure a coveted spot for their children. The Ontario Undergraduate Student Alliance also published an article that highlighted the gap in post-secondary education offerings for French-speaking students. Only four public universities in Ontario offer comprehensive French-language programs, forcing Ontario francophone students to pursue English-language programs or programs in Quebec. Whether it’s due to the lack of education options or overall exposure to French outside of Quebec, finding bilingual talent is highly competitive. So it’s important to be prepared and move quickly when seeking bilingual hires. Move quickly – if you have a strong bilingual candidate on your radar, it’s important to move quickly as they will most likely have a number of other employers eyeing them. Ensure you have started working on all the necessary paperwork and get the candidate in front of decision makers right away. Pay them well – with bilingual hires you are essentially getting two-for-the-price-of-one. So make sure you are providing them with an offer that matches their skills and if possible, exceeds the standard market rate. Many companies do not consider offering higher compensation to bilingual employees, resulting in subpar hires or an increase in turnover. Identify their bilingualism – it’s important to understand that a working knowledge of French in a bilingual position doesn’t always meet business needs. To ensure your bilingual hires are appropriately skilled and will fulfill the required tasks, ensure you have someone interviewing them who can speak French fluently. If you don’t have someone internally, there are a number of professionally trained bilingual recruiters (such as our BlueSky Personnel Solutions team) who can assist with the qualifying process. Don’t procrastinate – If you have established a need for a new bilingual hire, you need to start the hiring process right away! Some companies end up delaying job postings or engaging with a bilingual recruiter based on certain business timelines. When it comes to bilingual hires, time is not on your side and the talent pool is slim. 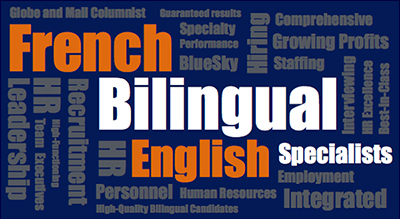 So build in some extra time to find and hire the right bilingual candidate for your team. Good luck and be sure to give us a call if you need support in your bilingual hiring process!